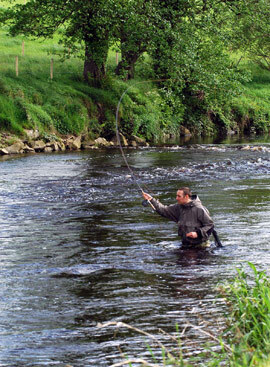 Anglers are spoilt for choice when it comes to Ireland, whatever their discipline. Game, coarse and sea angling can all be enjoyed throughout Ireland in various locations but always with delightful scenery. 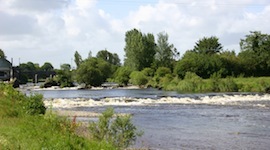 We have now added the River Moy to our Irish fishing section. The River Moy in County Mayo Southern Ireland is the most prolific salmon river in Western Europe with an estimated 100,000 fish running it every year. The Foxford Rocks beat is situated above and below the town of Foxford, about 7 miles from the tidewater so sees tens of thousands of fresh run fish. This fishery has been developed during the last five years to make it the best fly fishery on the lower Moy. Unlike the rest of the lower water down to Ballina, which is all slow water, the Foxford Rocks has a very considerable gradient and a good flow throughout the beat. New pools have been expertly designed and constructed to accentuate this and to allow the fly to fish with minimal assistance. 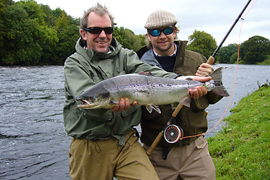 It is an exciting stretch to fish, although not at all difficult, particularly in the lowest two pools.